What’s The Difference Between Montreal Bagels vs. New York Bagels? 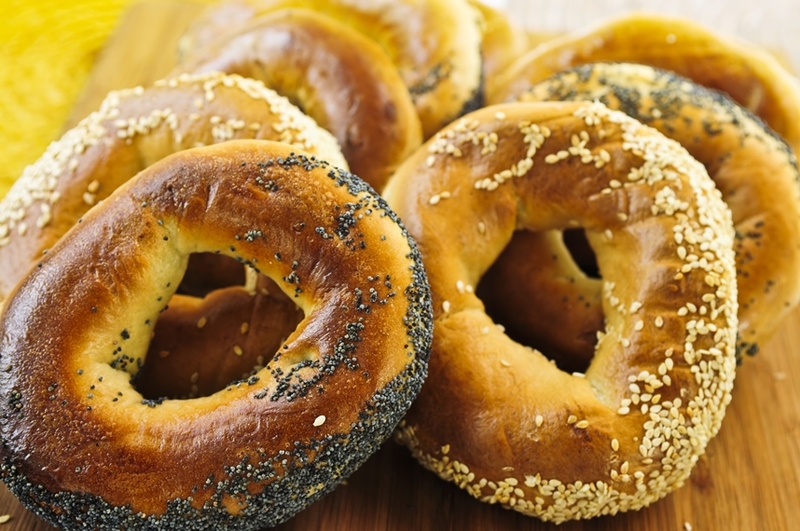 Montreal bagels are created and cooked much differently than New York style bagels. Hand-rolled, boiled in sweetened water, and baked in a wood-fired oven, Montreal bagels are thinner, smaller, and much sweeter than their counterparts. New York bagels tend to be much larger, with a softer, more chewable interior due to the lack of eggs and it’s time spent baking in more traditional ovens. So, which is better? It’s an age-old debate nearly as old as the bagel itself, with hundreds of foodies, chefs, and bagel enthusiasts polarized over the issue. Decide for yourself, check out our list below that stacks the two bagels side-by-side. Here’s a quick glimpse into how some of our best bagels are prepared, boiled, and cooked. As mentioned above, the true differences in the two bagel styles lay in the preparation. Our cooks stay faithful to the traditional steps, from poaching the dough in honey-water to baking them in large, wood-fired ovens found in our bagel bakery. Below we’ve compiled a simplified, quick list detailing our process and showing which steps are responsible for a Montreal bagel’s signature taste and feel. Simply allow the bagels to cool slightly before serving! And Don’t Forget About Our Bagel Toppings! A bagel wouldn’t be complete without an added dash of flair, flavor, and personality. Take an already humble treat, and customize it with our numerous toppings to create an elevated taste. Take a look at our favorites below! Come Try a Montreal Bagel Today! The idea of the bagel has been around for hundreds of years, but we like to think it was recently perfected in Montreal. The sweetness of the dough, the crunchiness of the exterior, and the denser end-result, produce a bagel that’s been elevated past other baking traditions. While other options still exist, like the New York bagel, we believe the Montreal style truly encapsulates the next evolution of the bagel. Make us your bagel place, and receive freshly baked, crispy and tasty Montreal-style bagels directly to your doorstep. Visit our website and order today!